You will learn to code like an expert, and also enjoy it like a game. It's easy, it's fast and it's fun! 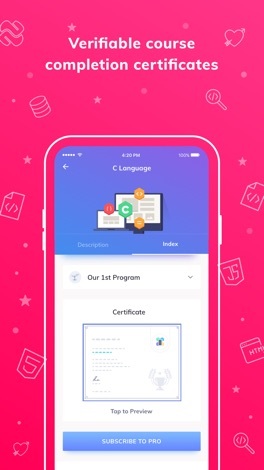 With a huge collection of 5000+ programs (code examples), 35+ courses and the fastest compiler in the world, all your programming needs are bundled in a single app for your daily practice. * Learn Java - Java is an object-oriented, general purpose, high-level programming language. * Learn C Programming - C programming is a powerful general-purpose language. 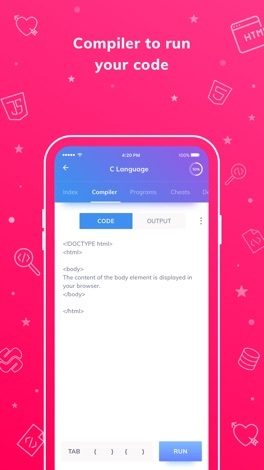 * Learn C++ - C++ is used nearly everywhere for everything from systems programming, numerical and scientific computing, web development, writing compilers, console games, desktop applications and so on. * Learn HTML - HTML is the standard markup language for creating web pages and web applications. * Learn R Programming: R is a programming language and software environment for statistical analysis, graphics representation, and reporting. 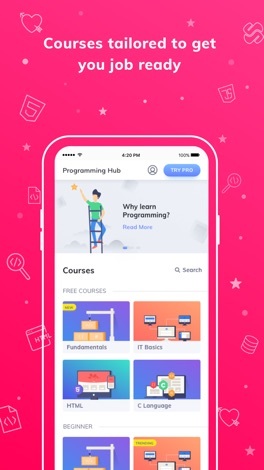 - Programming Courses: To make your learning more interesting, our experts have created bite-sized and interactive courses which will help you learn programming like never before. - Programming & Coding Examples: 5000+ programs in 20+ programming languages and counting, programming hub has one of the largest collection of pre-compiled programs with output for practice and learning. - Compiler: The fastest compiler in the world on iOS with support to compile and run over 20+ programming languages. Programming Hub VIP Access gives you unlimited access to all courses, continuous extensions to the courses, and the additional courses we release on a regular basis. Programming Hub VIP Access is USD 5.99 for 3 months, quoted in U.S. dollars (prices may differ in countries other than the United States). Programming Hub PRO membership is USD 6.99 for 1 month, USD 14.59 for 3 months and USD 41.99 for 1 year quoted in U.S. dollars (prices may differ in countries other than the United States). Upon confirmation of purchase, payment will be charged to your iTunes account and your account will be charged for renewal within 24 hours before the end of the current period at the price of the chosen subscription. Any unused portion of a trial period, if offered, will be forfeited when you purchase a subscription. Discover "What's Up!" in beautiful Islamorada, Florida. Find something new to do - from live music, attractions, bar hopping, dining, fishing tournaments, festivals, farmers markets, and more! Your visit to the Florida Keys will not be complete without this app. This is the app to be used by delivery personnel of clients of Locus. The login restricts the same to pre-registered users. Features: Tracks delivery personnels location Provides details about tasks to be done. Allows actions on tasks like status changes, collecting ePODs.